It’s the secret to all great designs, photos, paintings, anything that’s two-dimensional. Are you using it? And it’s actually a great way to avoid that blank screen stare down… you know, that feeling you get when you have to start a project, but the blank document on the screen just seems to be taunting you? Daring you to put something fabulous out in the world? Put that blank document to shame by slapping down The Grid. The grid is just a well-measured system of intersecting lines. We see it in graph paper, or we can turn on a grid in the settings of our smartphone camera. And if you look closely at well-planned print and digital designs, you’ll start to notice a grid in those pieces as well, it just may not be as visible as the graph paper grid. People tend to understand a message better when there’s a framework, an order to follow. 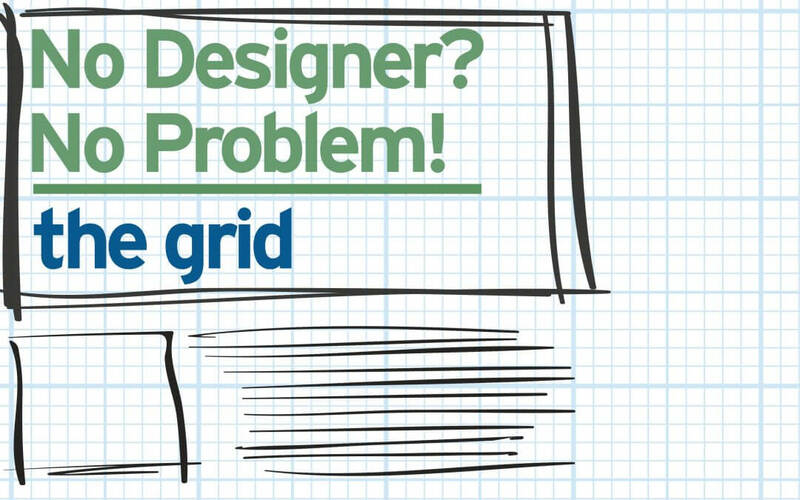 The grid helps designers appeal to that instinct. If there’s no structure to a layout, the user spends energy and time trying to organize it themselves. Or they just move on to something that doesn’t require so much work! We can use that human tendency to our advantage as we decide what elements need to be seen in which order. We can use the grid to move people through a design and to a call of action for instance. How do you use The Grid? Start with organizing your elements into blocks. As in, you’ll need a ‘block of copy’ over on the right. Or you know you’ll need a series of photos along the bottom. Digital designers call this stage the “wireframe” and it can look something like this for a website. Then make sure your blocks, your elements, all line up along the same grid points. For instance, line up your left edge of your headline with the left edge of photo; get the baselines in your copy blocks all squared up to each other; use the bottom of a graphic as the ‘line’ for where the text should end. And remember, the point here is to help keep the information organized and structured to help guide your reader/viewer. All good communications have a great foundation of organized elements, get yours on the path to greatness by getting out The Grid.